A few of our Bellyitch Bumpwatch alums attending this weekend’s March For Our Lives rally in Washington, DC. Kim Kardashian West‘s husband Kanye West attended the event with his daughter North and her grandparents. 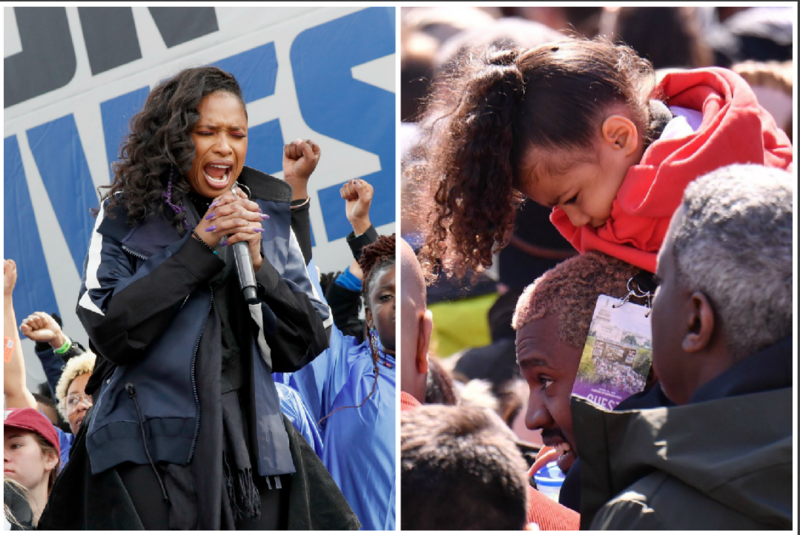 They were spotted with North on her papa’s shoulders in the middle of a packed crowd. ﻿ The movement calls for stricter gun control laws following the massacre of 17 students at a shooting at Marjory Stoneman Douglas High School in Parkland, Florida. Other celebrity supporters of the event include Selena Gomez, Amy Schumer, George Clooney and Paul McCartney. Hudson gets props for always jumping in to support youth movements. She is among a host of other celebs (like Beyonce, Alicia Keys, Rihanna, Lenny Kravitz, Zoë Kravitz, Queen Latifah, Pink, Bono, and Rosario Dawson) to also support the Black Lives Matter movement aimed at addressing disproportionate number of killing of UNARMED black civilians by police with impunity. Kanye West has a history of controversial statements but has also been a supporter of the BLM movement.